Dear graduate students, the regular installment of The Alcoholic Horndog Tenured Professor Stereotype on Film has been interrupted by a more urgent matter … namely the Horndog Disgraced Politician Stereotype. Edwards stayed for two hours, leaving around midnight. He drank white wine and light beer, according to multiple attendees. After a while, Edwards made his way to the dance floor. “He was kind of uncomfortably dancing,” Jentgen says. Uncomfortable dancing! White wine! All the hallmarks of a bad grad student party. And the grad students encouraged Edwards to join them. This episode demonstrates the kindness of grad students, who rarely give up an opportunity to champion a lost cause. This is dangerous, however, because a disgraced politician is one step lower than some horndog geezer in your department. If you mingle too closely with the geezer, you might get a job. If you mingle too closely with John Edwards, you might get something else. Whatever it is, it sure won’t be gainful employment. Download this: When a seemingly familiar man with thick hair and a dazzling smile approaches you, back away slowly. If half the things that were written in Andrew Young’s “The Politician” were true, then John Edwards will steal your heart, your cash, and your favorite bottle of salon-level conditioner. Image of John Edwards public domain, from Wikimedia Commons. Sadly, pictures of uncomfortable dancing were not available. If you have a picture from said event, let us know! 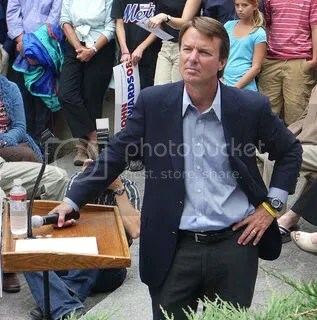 Subscribe to comments with RSS	or TrackBack to 'Grad Student PSA: How to Handle a John Edwards Partycrashing'.